Virtual reality (VR) is no longer just about "gaming." VR has had many exciting and practical uses that extend far beyond the fantasy gaming world for a long time now, but its cost has made it inaccessible to many. Now that's changing and many industries—from the medical field to the architectural community—are reaping the benefit. The same is true of social work. VR offers nearly endless possibilities when it comes to working with clients. Patrick Bordnick, PhD, MPH, dean of Tulane University School of Social Work, says that he was working with VR long before "it was cool." Two decades ago, very few people would have known what VR was and only a handful of academics were using it for research. But Bordnick was exploring its capabilities for use in behavioral health. Back then, Bordnick says that many of the headsets in his lab could have ranged from $5,000 to as much as $50,000 apiece, making the technology cost prohibitive to practitioners. But today, that's all changing. With the cost coming down, VR is on its way to becoming mainstream. Over the years, Bordnick has been involved with researching the ways in which VR can assist with addiction treatment. He says that it has always struck him that the role-play scenarios being worked through in the office to prevent relapse lacked the "real world environment" that patients would be exposed to. That is when Bordnick began developing virtual environments, the first being a "smoking party." "We would use the environment to bring the real world—or a realistic representation of the real world—to a safe clinical setting in order to work on coping skills to prevent relapse," he explains. "This allows us to assess relapse triggers and teach better refusal skills. We have found that when people work through these skills in the VR environment, they are more empowered to use those skills when confronted in real life." The same approach could be used with alcohol use disorder—creating a bar scenario that the patient must navigate, learning to refuse drinks, Bordnick explains. He has even created a virtual "heroin environment," in which former drug users can navigate the space, learning skills to resist relapse. Bordnick says that the technology can be leveraged for multiple uses and presents many exciting opportunities. Albert "Skip" Rizzo, PhD, director for medical virtual reality at the Institute for Creative Technologies and a research professor in the department of psychiatry and in the School of Gerontology at the University of Southern California, has been working with VR as long as Bordnick but primarily in the area of PTSD research. After viewing a realistic war game experience in 2003, Rizzo says he had the idea to build VR simulation of Iraq and Afghanistan for use in exposure therapy and treatment of PTSD. "In using exposure therapy in its traditional form, you would use the imagination alone," he explains. "You are asking them to narrate the experience in the safety of the office and then process those emotions in the office. The use of VR helps take that experience to another level." While the prototype that Rizzo built for this purpose was initially turned down, some emerging research (at the time) that showed around 16% to 17% of those who fought in Iraq and 11% of those who served in Afghanistan were experiencing PTSD changed everything. By 2005, the project was funded. "At its core, VR is an evocative experience," Rizzo says. "It gets patients talking to the clinician in a way that they wouldn't have otherwise. And the clinician is seeing everything that the patient sees." Rizzo emphasizes the latter point—and its importance—and is quick to add that it's essential that the clinician be present in this type of experience. He calls it a "tool" in the clinician's tool bag and says that it was never meant to replace the clinician—nor can it be used to its full extent without the clinician. "We are not replacing good clinical skills or building self-help or automated treatments by bringing VR into the field," Rizzo says. "VR is a tool to amplify and extend an already known process. We already know that traditional trauma-focused exposure therapy has a good evidence base. All VR does is amplify that approach by using simulation technology." Bordnick agrees. "This is not a stand-alone treatment device," he says. "VR must be used alongside a trained therapist in order to be effective. You can't send your patient into one of these virtual environments and have them navigate it on their own without the clinician there to teach evidence-based coping skills and strategies. You aren't going to make any progress that way." Rizzo is also quick to add the importance that neither the client nor clinician view VR as a "quick fix." He says that in the end, it's a tool that is meant to deliver an already existent, evidence-based approach to treatment. "It's like giving a stethoscope to an MD of the 16th century who was listening to patients' heartbeats with an ear to the chest," Rizzo says. "The technology alone does not fix anyone. It's the technology in the hands of a trained clinician that makes all the difference." VR has come so far from where Bordnick and Rizzo started out, but they both express that there is even more exciting potential on the horizon. Bordnick is currently exploring the ways in which we are training the next generation of social workers to prepare for disaster scenarios. If they never have any previous exposure, it's quite possible that they will present with anxiety when exposed to extreme situations. So, Bordnick is looking at using VR to better prepare them. "With VR, you can teach a social work student by guiding them through an environment in preparation for disaster work," he says. "Let's take a hurricane, for example. You could walk them through a building before a hurricane strikes and then after, preparing them for what they might experience in a disaster scenario. Students will then be better prepared to help others in real world disaster situations." 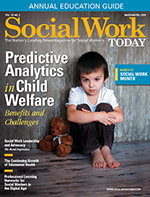 Of course, Bordnick says the technology can also train others beyond the social work profession. For instance, it could train an architectural student to recognize building vulnerabilities by exploring a building pre- and posthurricane. And it could prepare a first responder such as a police officer or medic for what they will see. There are so many applications, he says. "From a social work perspective, imagine the possibilities involved when students get an opportunity to interview a family and assess their needs posttrauma—all in a virtual world," Bordnick adds. "You can train students to work these scenarios so that they are better equipped when they're really needed." Bordnick adds that the future requires more collaboration between those that have the technology skills and those that have the clinical skills. You need to have the right virtual environment in order for the therapy to be effective. "It's exciting to think about more people with a technology background working with social workers like myself—with the clinical background," Bordnick adds. "We need more collaboration." And, Bordnick adds, it's also important to keep educating so that practitioners, such as social workers, get over any fear they might have of implementing technology in their own practice. "I think leveraging and using this technology to enhance what we do as therapists is the most important goal of the future," he says. "The biggest learning curve is just getting over that initial anxiety—that fear—about what this technology is all about. It's not here to replace any jobs; it's truly just the opposite. We need clinicians to make the technology work the way it's meant to work."